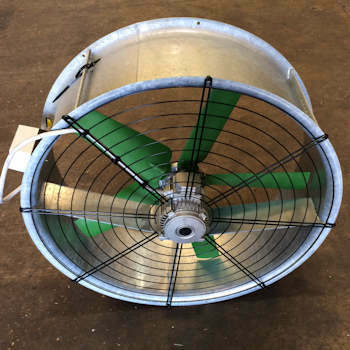 This circular blast fan is a high output, direct drive fan ideal for smaller or low roofed barns and milking parlours. It will keep your animals cool, dry and comfortable and keep out the flies. 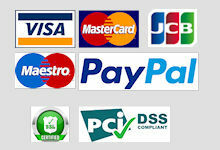 Fixings chains are included, the fans are in stock and will be delivered 2-3 working days after ordering. Cows begin to suffer from heat stress when the building temperature reaches 24°C and stress becomes severe at 32°C, not uncommon during a good summer in the UK. Stress and humidity can reduce milk production and pregnancy rates in cows and lead to respiratory problems in calves. These circular blast fans move a high volume of air for approximately 20 metres. 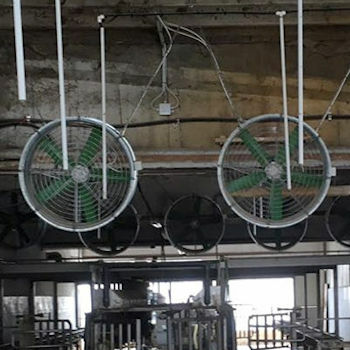 Easy to install, they are typically suspended by chains from the barn beams, above the animals, where the moving air keeps the animals cool, increases evaporation and disperses the flies. The fans are particularly suitable for smaller or low-roofed buildings such as calf sheds, milking parlours and holding areas. For larger or higher-roofed livestock barns we recommend HVLS ceiling fans – please give us a ring on 01327 300 395 to find out more.